Length: 2 hrs. 17 min. You’ve heard the Christmas story time and again. Perhaps it seems there’s nothing new to discover. Take another look, a closer gaze, at the details that reveal God’s love in the gift of a baby who would forever change the world. 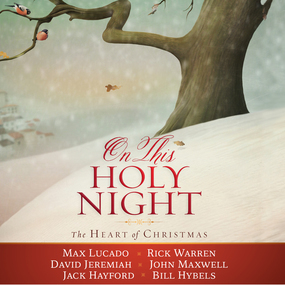 Six beloved Christian authors — Max Lucado, John Maxwell, Jack Hayford, Bill Hybels, David Jeremiah, and Rick Warren — share from a unique perspective and help you hear afresh the message God wants to whisper to your heart during this holiday. God loves you. God is with you. God is in every detail of your life. The message of Christmas is the message of eternity. Revealing the relevance of the Christmas story for our modern lives and beautifully designed for gift giving or personal use, On This Holy Night is sure to be treasured for years to come.